After twelve years of depression, the American economy finally recovered by 1941. Even if the gross domestic product of 1937 exceeded that of 1929, the population increase during those years meant that the average consumer received little comfort from that parity. However, by 1941 gross domestic product per capita exceeded 1929 by ten percent, enough to compensate for the increased government expenditures of New Deal programs and rearmament. That year, the Northern Litchfield County Council set its annual campaign goal at $7,100, and raised enough funds to open Camp Workcoeman for five weeks, the first five week season since 1934. The stronger economy and the successful fund drive also allowed for facility improvements at camp. The council paid to upgrade the plumbing in the kitchen and replaced the stovetop boiler with running hot water, for washing dishes. Council Finance chairman Floyd Pearce persuaded The Exchange Club of Torrington to donate a Handicraft Lodge to the Scouts; Pearce phrased his pitch as a challenge from the Canaan Exchange Club, who had already committed to buying new rowboats and canoes for Workcoeman. Exchangites donated lumber and helped with most of the construction; one of their number, Herbert Jones, brought his carpentry class from the trade school to camp to complete the rough framing. Club members also installed the hot water system the council bought. The Exchangites collected used hand tools from Torrington citizens, then repaired and sharpened the tools to supply not only a building but also the materials for a camp program. To staff the new lodge, Council Executive Palmer Liddle sent Assistant Camp Director Carl Bergquist to National Camping School, to participate in the Handicraft Section. Liddle did not join the 1941 staff himself, and brought in former Aquatics Director Clarence Rosenbeck to serve as Camp Director. 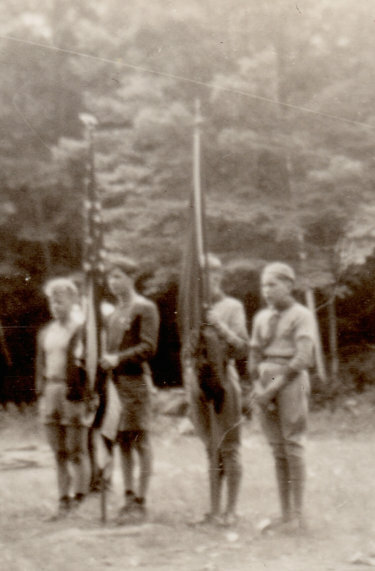 Rosenbeck was Scoutmaster of Troop 14 and of the 1937 Jamboree Troop. Back in 1929, Rosenbeck had played camp director when the campers took over Workcoeman’s operation. In 1942, he brought back this program feature, and campers ran the Workcoeman program on the third of July. However, the highlight of the first week was a fireworks show, put together by the District One Committee, composed of Scouters from Torrington and Harwinton. The fireworks show helped to boost the numbers of campers during the sparsely attended week one. During the other four weeks, Workcoeman was full, with seventy-five campers, and a season total of one hundred and seventy-four separate Scouts. The image below shows the Handicraft Lodge during the 1940s. The structure now serves as the Trading Post.